You probably know how hard it is to get a reliable sight. There are plenty of good reflex sights on the market, but you will agree with us when we say that they’re not all great for pistols. It’s important to choose a sight for your specific weapon, or otherwise, your shots won’t be accurate enough for your needs. That’s why choosing the best pistol reflex sight entails different things than choosing the best rifle sight, for instance. A pistol sight is easier to use on your pistol than an AR-specific sight that would hinder your accuracy and your movements. It’s also better in terms of your purpose, which is why we’re here to help you make a valid purchase decision. 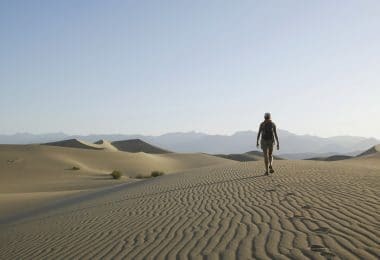 But in order to make the right choice, there are some factors to take into account. We’ll discuss all of them below, after which we’ll talk about some top-notch products. And if you want a summary for all that, take a look at the table below. We think the most important thing to consider is your purpose. Even if you choose the most qualitative, amazingly built, expensive, last gen device, and that’s not right for your needs, you’ll still be dissatisfied. So we’ll explain all the factors below depending on your needs. There are different reticle patterns and lights, so it’s important to choose the one that fits better. A red dot reticle is the most common for reflex sights, but you may also need a green dot to see better in brighter light. Most of the best red dot sights for pistols have various brightness adjustments, though. That’s also good for moving from shade to light and vice-versa. Apart from the dot pattern, you might also need a crosshair for more accurate shooting, or a bullseye for competitive shooting. The 3-5 MOA is the most common reticle size, 1 MOA referring to 1 inch at 100 yards. However, the smaller sizes are better for varmint, while bigger reticle sizes are great for long-distance shots. 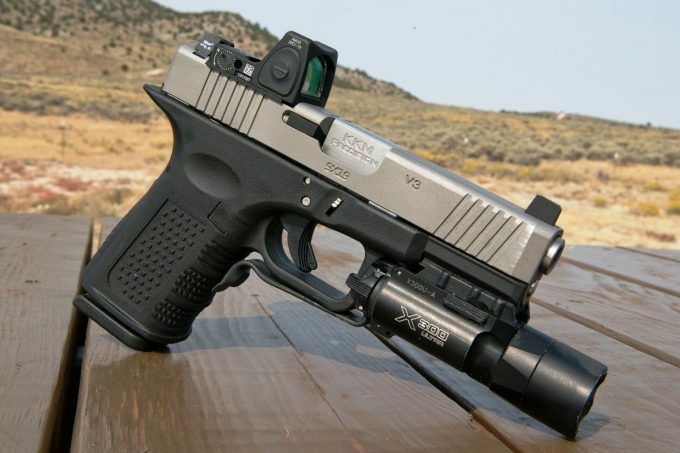 Since you’re going to use this sight with a pistol, you should check whether your sight is resistant to recoils. A minimum of 1000 G’s is great for this purpose, but you can also check if the official specs state whether or not the sight is shockproof. Of course, a bigger recoil resistance is more important for beginners, as well as for people who are planning an extended use. 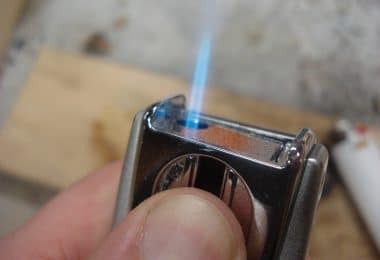 Conversely, if you’re sure you can have a great grip on your pistol, or if you’re just not planning a prolonged use, you can leave this feature at the end of the list. The most common and easy to fit mount to pistols is the Picatinny mount, and this can also go with rifles or other weapons. However, the Weaver mount can be good for certain pistols too. Make sure you pick a versatile enough mounting system, that allows easy setup. A removable mount is even better, so you can change it as you like. But at this point, check if your sight needs re-zeroing once you change the mount. 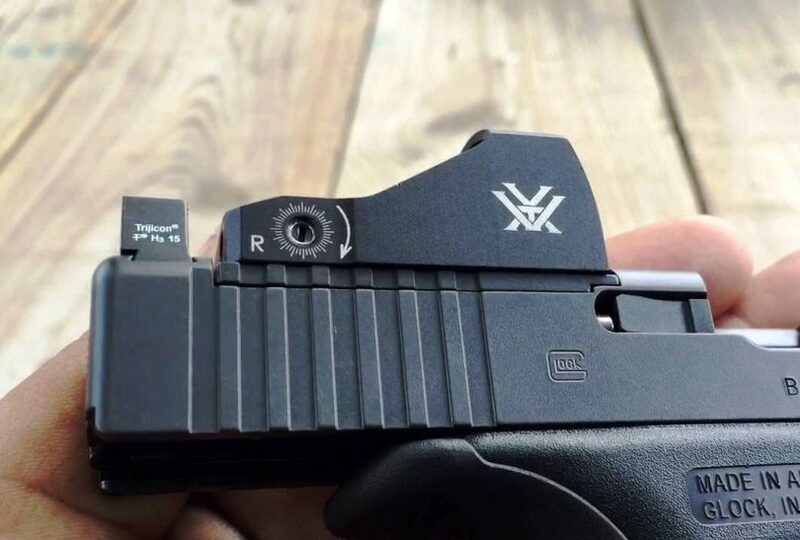 You need a very resistant sight for your pistol. That said, very solid materials normally weigh more, which isn’t something you want for a pistol sight, though it might be ok for a rifle sight. So look at the overall weight and dimensions too. A bulky and heavy sight might not be easy to handle and might even block your view. It might destabilize your weapon, which means it’s less accurate and harder to use. Make sure the materials used are qualitative and resistant. For instance, an aluminum body is excellent. The added finish is also great for increased water resistance, maybe even scratch-resistance. Also, check if the optics are covered with multiple layers of nonreflective coating, so your image is bright. A tubeless design also sounds appealing when you’re after moving targets on the field. That’s because this design equals a larger field of view and a larger lens aperture, so you can keep track of your game. That said, let’s take a look at what the market has to offer. We’ve carefully selected the products below, and explained their main features keeping their intended use as the central focus. That helped us summarize their pros and cons, so you can have a complete picture. 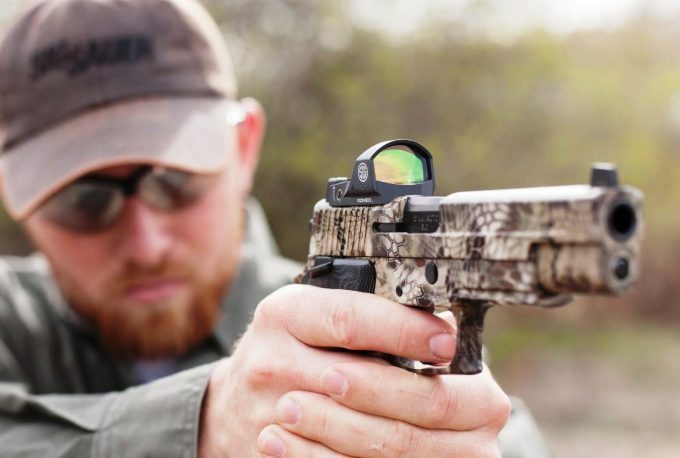 The Burris Fastfire III Sight is one of the most qualitative red dot sights for pistols since it was extensively tested for on-field conditions. 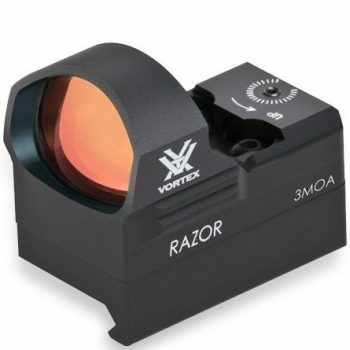 The 3 MOA reticle is clear enough so you can take precise shots, at versatile distances. We love the focus on user experience, with automatic windage and elevation adjustments, of 190 inches at 100 yards. The battery house is positioned at the top of the sight, which is pretty convenient. And the power button can be pushed to set a brightness level from the four existing ones. You can count on the auto-adjusting brightness, especially when you’re moving from a shade to the sunlight, though it takes a little time when you’re doing it the other way around. Plus, the off and very low brightness settings will look the same in low light. However, we really appreciate how easy it is to zero this sight. The low battery indicator is another plus, as well as the socket head, the Torx wrench and the CR 1632 3 V lithium battery included in the package. However, the included protective cover is pretty tight and difficult to put on or take off. The Weaver/ Picatinny style mount is a plus in terms of flexibility. We love the high recoil resistance of this sight, which is at least 1000 G’s and therefore perfect for pistols and rifles alike. The large operating temperature range of -10°F to +130°F proves this sight’s resistance. However, you should know it can be scratched pretty easily if you’re not careful. 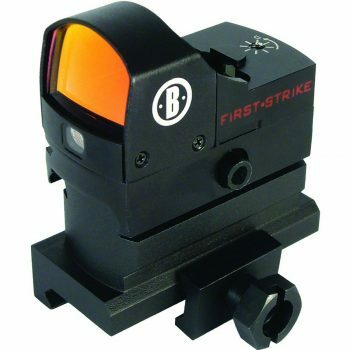 Related: In order to protect your Fastfire III, we recommend the Burris Fastfire Mnt Picatinny Protector, which was designed especially for that. Or, if you settle on the older model, Fastfire II, this ingenious little device will work for that too. The Bushnell AR Optics First Strike Riflescope is a really light scope, weighing just 2 ounces. 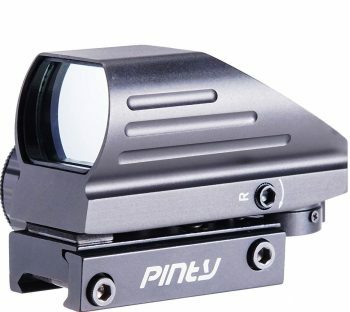 It has multicoated optics for increased image brightness, and a 5 MOA red dot reticle for versatile kills. The 5 MOA is small enough so you can get a precise target acquisition of varmint, but big enough so it can still be noticed. However, it only works well at short distances, not beyond 100-200 yards. The one-piece base for Weaver or Picatinny rails shows the versatility of this sight, and also its solidity. The auto-brightness adjustment feature helps prolong the battery life since it can even shut down on its own, but you have to put the protective cover on first. On the other hand, you can’t pick a brightness level that’s convenient for you, and there’s no on/ off button. The matte finish renders it waterproof, but it’s also shockproof so it can withstand bigger recoils. The riser block is amazing for easy set up at a convenient height, both on shotguns and on AR15’s. Related: We love the NcStar Weaver Style 45-Degree Offset Rail Mount for this sight. It fits perfectly, it’s manufactured from solid materials and can protect your sight, securing it better to your pistol. 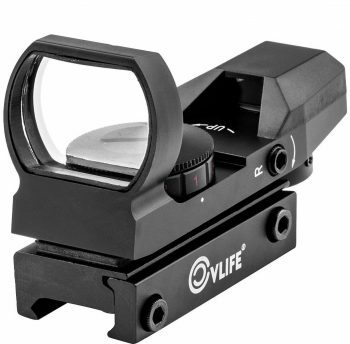 The CVLIFE 1x22x33 Reflex Sight is an inexpensive sight but works best for amateur shooting, maybe even some practice. Since it has a low retail price, you can imagine it’s not the high-end quality of more expensive sights, though it does its job. The 22 x 33 mm screen is good enough for light transmission, and it’s also coated with a layer of anti-glare coating. The high-grade aluminum alloy body renders it resistant, and the tubeless design makes it look great. We love the unlimited eye relief, and the corrected parallax. On the other hand, the windage and elevation are manual, which might be difficult to set. The 20 mm rail is definitely an asset, and so are the multiple reticle patterns. With a red or green, circle or cross, 10 MOA or 3 MOA, you can shoot in different light settings and different sized targets. On the other hand, the dot reticle might be a bit blurry, and it’s difficult to see in bright environments. The focus might also be a little off, but we appreciate the complete package with Allen wrench, CR2032 Battery and cover included. Related: A similarly priced rifle scope, the CVLIFE Hunting Rifle Scope is our recommendation if you also have a rifle. It also has a green and red reticle, but it works at bigger distances, providing an adjustable focus. The magnification ranges between 6x to 24x, which means you can shoot all sorts of game or targets. 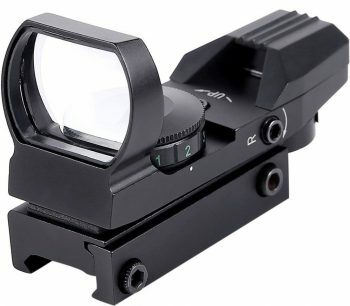 The Ohuhu OH-RG-SC Reflex Sight is another affordable sight that has a surprising quality. That’s if you’re into hunting smaller animals at a shorter distance. It works well with air pistols or Plinksters, and it has a tubeless design. The 33 mm lens aperture means you’ll have a big field of view, which is great for fast shooting and moving targets that need to be followed. There are four reticle patterns here, dot, cross, bullseye and star, each on red and green. That means you can shoot different targets, from varmint to target practice, and in different light settings. There’s a built-in mount which works great for standard bases. The best thing is that you won’t have to re-zero this sight once you change bases. However, you’ll have to zero it in first by using some iron sight. Otherwise, it’s pretty difficult to get a good accuracy level. The parallax correction and unlimited eye relief show real user-friendliness. On the other hand, it’s sort of difficult to adjust the windage and elevation fast and accurately, with the included Allen wrench and locking screw. We really appreciate that such an affordable device is waterproof and shockproof, withstanding the pistol recoils so well. Even the battery lasts a lot, and you’ll get one included in the package. However, you should be prepared for some degree of refraction. Related: Need great visibility during the night? In that case, the Monstrum Tactical 90 Lumens LED Flashlightis just the thing. With an awesome LED and great resistance to impacts, this flashlight can easily be mounted on a Weaver or Picatinny rail and assist the sight you’re getting. 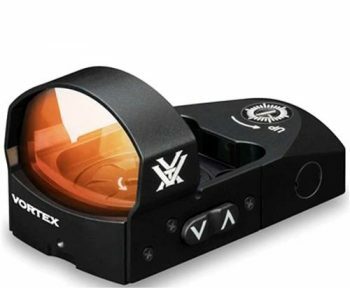 The Vortex Razor 3 MOA Red Dot Sight is a fast and accurate reflex sight, at a price that’s translated into a qualitative design. The glass is very polished and covered with multiple layers of anti-reflective coating. That way, light transmission is increased and the rendered images are bright. You’ll get a very good resolution and a wide field of view that’s perfect for following moving targets. The non-critical eye relief is something we love about this sight, since it helps with fast target acquisition. The 3 MOA red dot reticle is great for medium-sized animals, and at versatile distances. The Picatinny rail mount is another thing that shows its versatility, and the battery life is long. The whole sight is small and light, with a wide enough window, so you can focus fast and easy. On the other hand, the windage and elevation are manual, and you need a tool for that. There may also be some issues when you zero it in because there aren’t any audible clicks for the adjustment screws. That way, it’s difficult to re-zero because you don’t know exactly how many clicks you need. Related: We recommend the Vortex Razor Red Dot Riser Mount that provides a 0.6-inch rise above the base surface. 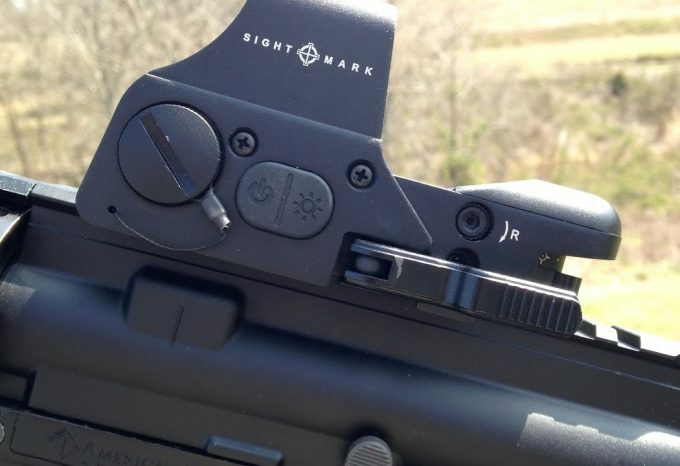 That way, you can use it with Picatinny rails, or install this sight on an AR15. The Pinty Red & Green Reflex Holographic Rifle Dot Sight is an affordable sight, that’s resistant to many on-field conditions. That’s because it’s manufactured from an aircraft grade aluminum alloy, which renders it waterproof and shockproof. However, this sight is also bulky and tall. The tubeless design with the 33 mm reflex lens is great for a wide field of view and short-range hunting. There’s a built-in Picatinny mount which fits very well on pistols, but you can certainly mount it on other weapons too. There are four red/ green reticle patterns on this device too. Red is great for night use, while the green light for more light and each reticle pattern is better for a certain target. The dot and star are great for smaller targets, while the crosshair and bullseye for increased precision. We love the powerful 650 nm LED, the comfortable unlimited eye-relief for fast focusing and the corrected parallax for clear images. On the other hand, the manual windage and elevation are pretty difficult to set, and zeroing it in isn’t a breeze either. 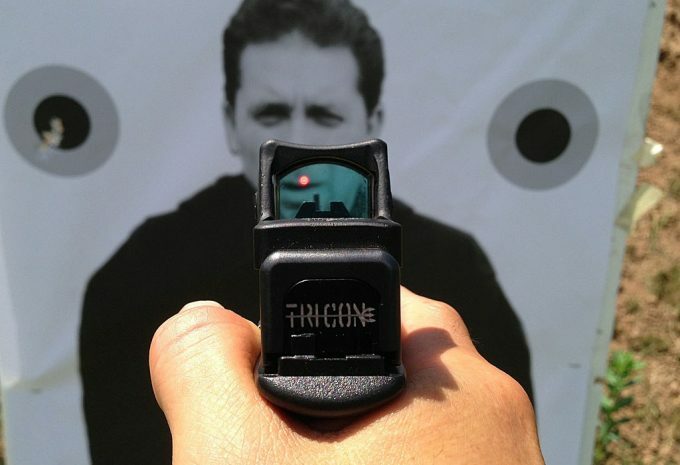 Related: We recommend the SOUFORCE Premium Tactical Flip Up Iron Sights go with this sight. Since it is pretty hard to zero it in, you might need some iron sights first. 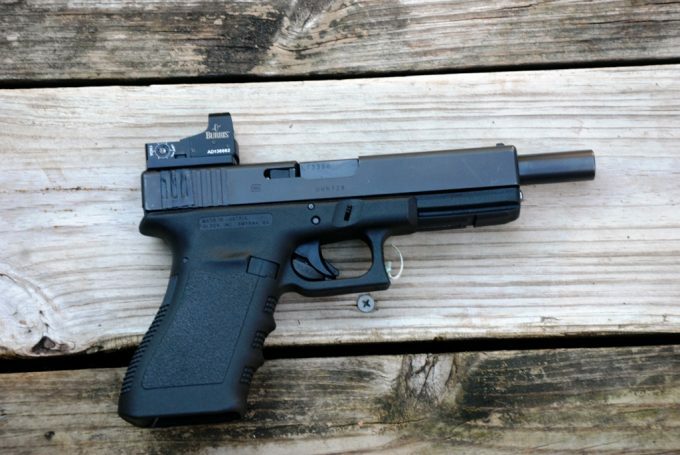 Plus, since this is a tall sight, the rear sight mounts you’ve got here are great for a more convenient placing. 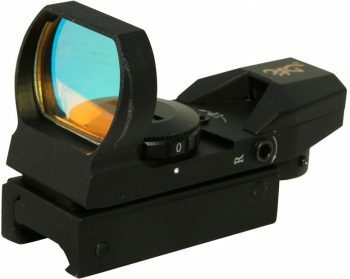 The Browning Buckmark Reflex Sight is a good reflex sight for short-range shooting. That’s because you can’t use it very well beyond 200 yards, though it’s really useful at about 50-75 yards. The four reticle patterns include the star, cross, dot, and bullseye, and they’re all on red. On the other hand, the 3 MOA reticle is pretty versatile and you have seven different brightness settings for it, even if the green color is missing. 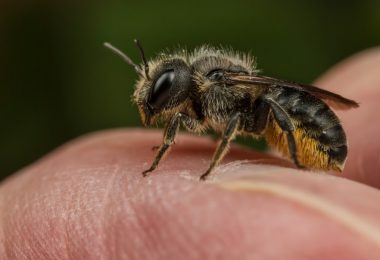 We love the unlimited eye relief for comfortable focusing, though the field of view might be considered a bit narrow at just 15.7 meters/100 meters. You need about 20 rounds to zero it, though after you do that, it holds the zero really well. There’s a Weaver-style base for this sight, and the aluminum housing with its black matte finish render it weatherproof. It can also withstand recoils pretty well. You need a 2032 lithium battery to power it, which might be an energy drainer. Related: If you buy this sight, you might also need the Browning Buckmark One Piece Matte. This rail fits it very well, and you can mount it on your weapon for competition shooting. Its purpose is to replace the rear sight on the Browning Buckmark .22 pistol. 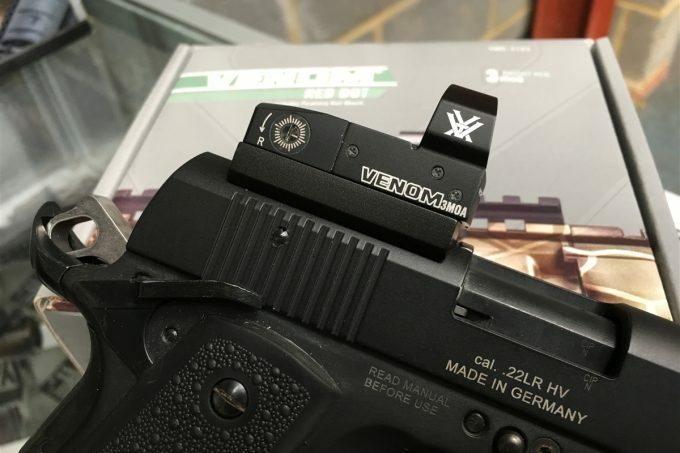 The Vortex Venom 3 MOA Dot Sight is a reliable red dot sight for your pistol, but it can also be used on shotguns or AR models. The 3 MOA dot is great for versatile shots, and it accounts for fast and precise target acquisition. There are 10 different brightness levels for this reticle, so you can use the Venom in different light settings. The Picatinny mount is great for pistols, and the top-load system for the battery makes it very easy to use. Also, the controls are conveniently placed on its left side. Even the 1 MOA windage and elevation adjustments are easy to make. We love the resistant machined aluminum housing and the fully multicoated lens for increased image brightness. However, the sight shuts off occasionally while shooting, and that might be because of the CR 1632 battery required. Also, the battery life isn’t that long. Related: If you get this sight, you probably need some spare batteries. That’s why we advise you to get the Energizer CR1632 3 Volt Lithium Coin Battery, which comes in a 5-pack. These are resistant batteries, with a long shelf life that come in a convenient package. 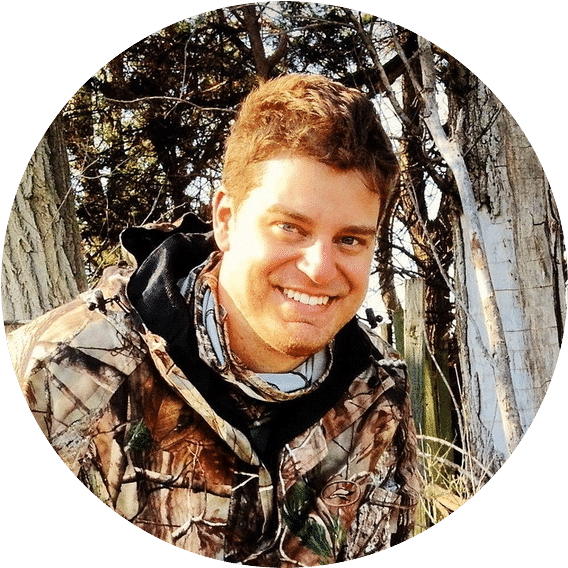 You might well consider one of our more affordable products, like the Pinty Dot Sight, all of which offer multiple reticle colors and patterns for versatile shots. But if you want to go brush hunting, the Bushnell AR Optics First Strike is the choice for you. 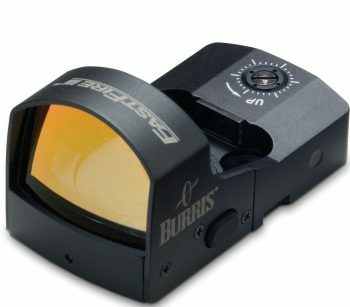 And for tactical shooters, we recommend the reliable Burris 300234 Fastfire III. However, those are just our recommendations. You should get a sight that suits your particular needs, budget, and design preferences. These reviews might be just your starting point, but we hope they serve as a good guide. That said, tell us what you ended up choosing and why. The comments are right below! 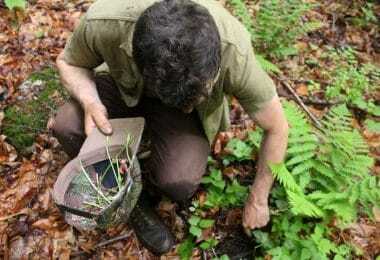 How to Choose Hiking Boots: Does the Boot Fit?